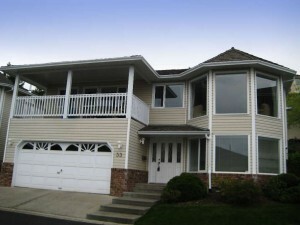 Very well kept Aberdeen home in popular gated bareland strata. This home features 2+1 bedrooms and 3 full bathrooms, a large kitchen with centre island and lots of counter space, huge living and dining room area with nice gas fireplace and mantle. There is a huge deck off of the kitchen with a beautiful view of the river and valley. All the living space on the main floor at the front of the home has nice views and lots of natural light. The basement features a large rec room with gas fireplace, a good sized third bedroom and a huge storage room/laundry room. There is a private back yard/grassy area and patio off of the 2nd bedroom on the main floor, this home does not have anyone located behind it. There is also a double garage and extra visitor parking in the complex. The bareland strata fee is $150 per month and includes water, sewer, management and garden maintenance. Pets are allowed with restrictions and rentals allowed with strata permission. There is RV parking but is presently a wait list for a space.